The entry-level compact luxury crossover market is booming and Infiniti wants in on the action. They've introduced the Q30 "active compact" at the Frankfurt auto show. Will it be the stick they need to stoke Infiniti's disappointing sales? It's no secret that sales for the Infiniti brand have been slow. The brand is gaining traction in global markets, but not as quickly as they might hope and not likely anywhere near where Nissan chief Carlos Ghosn would like to see to meet goals for the company overall. The luxury market is not an easy one to crack and despite beautiful designs and road-worthy offerings, Infiniti has yet to really gain more than a beachhead. That could change with the hot new Infiniti Q30 compact crossover. The luxury market for entry-level, compact crossovers is growing fast. It's mirroring the standard market's growth in that arena as more and more compact car and small car buyers turn to hot hatchback crossovers instead. In the luxury segment, marques such as BMW, Lexus, and more have brought compact crossovers to showrooms and are seeing success in the early stages of the segment. Infiniti wants to cash in on that before the segment takes off without them. The Infiniti Q30 is an "active compact," introduced at the Frankfurt Motor Show in Europe this week. New Infiniti President Roland Krueger, who we met briefly in Detroit last January, is excited about the prospects of this new compact hatch. The Q30 has been designed along two lines of thought, one aiming for a Premium-oriented buyer and the other for a Sport-centric driver. The production Q30 is very close to the concept verion shown two years ago, with bold lines and a fast, sporty appearance. We give Infiniti props for not holding back in terms of design risks. The head of design at Infiniti, Alfonso Albaisa, talks about the Q30 and its global design cues. 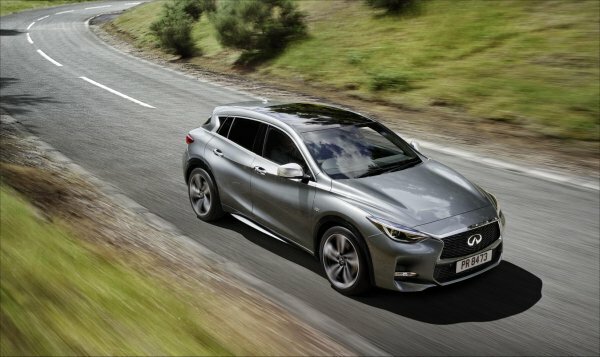 The Infiniti Q30 will be the first vehicle built at the newly-upgraded Infiniti facilities in the United Kingdom. It becomes the first compact in Infiniti's lineup as well. The Q30 enters select markets later this year, beginning with Europe. We'll have more details on this new compact soon.